Drones and privacy–will you allow it, or shoot them down? There’s quite a bit of talk these days about drones, or unmanned aircraft (UAS). These have several problems, when you get right down to it. Noise pollution – it’s annoying enough when Sherrif’s helicopters fly overhead and loiter for awhile, but while a UAS would probably be quieter, it’s still not silent. Privacy – are you comfortable having cameras over your home or business, watching you and recording what you are doing? If you are, perhaps Russia would be a better place for you to live. I am mainly concerned about #3, though the first two certainly are things to think about. As time go by we (as a nation) are slowly giving up our privacy by allowing our lives to become more public (we post personal stuff on Facebook or Twitter and then wonder how stalkers know about us for example). Todays youth has grown up with this pervasive social network and doesn’t even give a thought to how their personal privacy is compromised by participating. It seems it’s only us old farts who grew up before this became prevalent who look at it and say “wow, that’s not good, nope, I’m not doing that”. Unmanned drones are another thing that is starting to take off (ok, sorry, couldn’t resist that). If we sit idly by and allow this to happen, then there will be no concept of privacy, even in your own back yard. One town in Colorado has a proposal drafted by resident Phillip Steel to do something about this, in a very American manner. According to Steel, “We do not want drones in town. They fly in town, they get shot down”. Excellent! The proposal was to sell $25 hunting licenses, and offered a $100 reward to anyone who shot down a drone “known to be owned or operated by the United States Government”. Wow, how cool is THAT?? The FAA of course (in their traditional role as spoilsports) takes issue with this, stating “Shooting at an unmanned aircraft could result in criminal or civil liability, just as would firing at a manned airplane”. They claim that they are responsible for airspace and safety and that a damaged aircraft could crash and hurt somebody or damage property (hmm… kinda like my #2 above even without the gunman, but I’m sure they feel THOSE risks are acceptable). Personally, I think that if everybody took the attitude that Mr. Steel has, that the FAA would find it difficult or impossible to enforce on a large scale, the government would find that they are spending a LOT of money to replace these expensive planes, and the whole thing would fizzle, much to the delight of privacy loving folks everywhere. Here’s another entertaining alternative, borrowed from WWII. The Germans had flying bombs which had no pilot and would fly across the channel, run out of Petrol (it’s England, folks), then crash and explode. They were quite terrifying as weapons because of their random targets and because you could hear them and knew you were safe… until the engine stopped. Very Hitchcock-esque from a terror standpoint, but I digress. The allies came up with a good solution. They’d fly up next to these things, put a wingtip under their wing and then roll their plane. This caused the bomb to bank, veer off course, and crash in the channel. Wouldn’t it be fun to do that with a Drone? Of course I never would do such a terrible thing, and I would never recommend that anybody else do such a terrible and rebellious act, but it’s fun to think about isn’t it? I bet there are a number of other fun scenarios that don’t involve something as direct as shooting a drone down. This could be a fun video game!! Here’s a short article in AVWEB about this amusing Colorado proposal. There are always compromises when trying to come up with a machine that works both in the air and on the road. Historically, companies working in this area emphasize the air, and give you a “roadable” machine which has pretty lousy performance, but gets you from your garage to the airport, and that’s about it. PAL-V, on the other hand has really worked on the road part of the equation, producing a vehicle which delivers high performance (112mph), has good range, and seems like it would actually be fun to drive. As far as the airborne side goes, an gyroplane is an interesting approach. It is a rotary wing craft, but the wing is not powered, it rotates from forward air pressure. This means you can’t land or take off vertically, but it is a lot simpler and cheaper than a helicopter’s rotor mechanism. It is quieter than a helicopter as the blades spin much slower, it takes off and lands at low speeds, and can’t stall. In the event of an engine failure, it can be auto-rotated to a safe landing. It’s designed to fly below 4,000 feet in uncontrolled VFR (visual flight rules) traffic. They say it will do 112mph in the air as well as on land! Terrafugia flying car–getting closer to reality! Terrafugia has been working on some interesting things in the flying-car realm. I wrote about them a couple of years ago, but now we are getting closer to being able to actually go out and buy one of these. 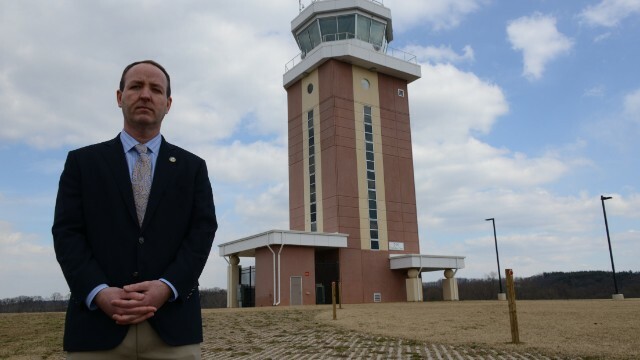 FAA tower closing plan–Irresponsible and Inane! With the government budget sequestration, many departments in our government have been forced to make budget cutbacks and adjustments (and not before time, if you ask me – governmental spending has been out of control for years). As a private pilot, I find one department’s response to be particularly disturbing. As soon as sequestration looked like it was probably going to happen, the FAA released a petulant sounding 5-yr-old statement staying that it intended to close most of the contract-based control towers at airports in the USA. Really? Is that the best they could come up with for things to trim with a budget reduction? I wholeheartedly agree with Mr Fuller. The FAA is behaving completely irresponsibly in this matter. There are other things for them to trim other than control towers which are directly responsible for traffic safety into and out of our airports. This is a picture of the brand-new control tower at Frederick Municipal Airport in Maryland. It was opened last May with $5.3 million in federal government funds. Now, this is just one of the towers on the chopping block by the FAA. This seems the height of absurdity to me. What does the FAA say about all this? The FAA says it is facing an untenable situation. By congressional mandate, it must cut nearly $600 million from its nearly $48 billion budget this fiscal year. Because the majority of its 47,000 employees are air traffic controllers, it is impossible to cut its budget without affecting controllers, the agency says. The FAA is furloughing employees, eliminating midnight shifts at some control towers and reducing maintenance on non-critical facilities. In an effort to affect the fewest travelers, the FAA said it is targeting lower-volume airports — those that have fewer than 150,000 operations a year (a takes off or landing is an operation) and fewer than 10,000 commercial operations. The 238 towers fall under those thresholds, including 49 FAA-staffed towers and 189 contractor-staffed towers. The FAA cuts to be announced Friday focus solely on the contract towers. The FAA claims that these tower closures will not impact safety. ROFL! Oh, there will be an impact, but most likely it will be the crunching of metal as two planes collide, causing loss of life and property. The FAA plans to reduce flight volumes to help, which means that flights to major cities such as New York, Chicago, and San Francisco could experience delays of up to 90 minutes during peak hours. This will of course have a ripple effect across the country. If you delay one airport, then you delay the airport where the flight originates also. It is time for the news media to get this into the public eye. It makes no sense at all, and something dire is going to have to happen before these buffoons are exposed. This does not have to happen! We cannot allow such irresponsible actions on the part of the FAA. So with the latest disappointment from Moller, I did some poking around to see what other people are doing. I turns out that quite a few folks are working on VTOL, but in a different way! It’s a shame that none of these products, even though some appear to work quite well, seem to make it to market. Especially ‘cause I want one! This is a rather interesting approach, and being a motorcycle rider, I like it! It’s being developed in Sydney, Australia and has a target price of approximately $45,000 AUD. Projected specs are: Airspeed – 150KIAS, Service ceiling – >10,000 ft, Dry weight – 110kg, Max gross weight – 270kg, Total thrust – 295kg. Development is funded primarily by Chris Malloy himself, with some donations. So, it’s a slow development process as a result. According to their website (no idea when the last update was), it has only been flown tethered, but they say it seems to be very stable. Another company has joined the development effort to produce the elusive flying car. As I mentioned in a previous post, this isn’t a new concept, and there have been several attempts over the years to address this market. The “Transition” by Terrafugia is probably one of the better looking and more interesting ones though. 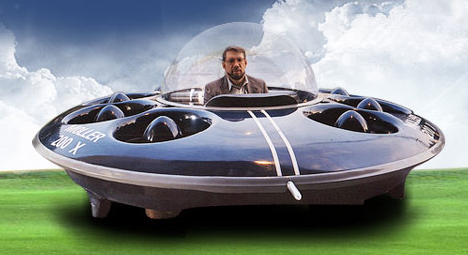 In contrast, one of the early and better known original flying cars is the Taylor Aerocar. This vehicle (below) has a “pod” which attaches to the back of the car containing the wings and propeller assembly. This pod is manually detached and left at the airport when the car is converted to road use. This conversion reportedly took 30 minutes. Clearly, pushing a button and staying in the comfort of the cab is much more convenient, especially in inclement weather. The only other variant I am aware of is the PD-1 Roadable Glasair being developed by Plane Driven. This one has an engine pod below the center of the fuselage which is slid on rails toward the tail of the plane, then the wings are manually folded against the sides for road use. The conversion is more manual, but doesn’t seem to awkward. There are many others, of course. Check out the Wikipedia article. I chose the ones above to talk about because they seemed the most practical and actually affordable. There are several interesting units being developed, but their pricing is ludicrous. Take the Urban Aeronautics’ X-Hawk for example. This has a projected price of $3 million. Maybe that’s OK for government search & rescue use, but it is obviously not useful to the general public.